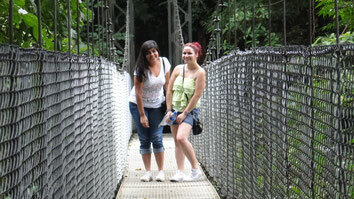 One Day Combo Tour at Arenal: Hike the Hanging Bridges, Arenal Volcano trail system & La Fortuna Waterfall. The best of Nature. Hike to the Lava flows and upon the rocks of past eruptions at Arenal Volcano. Around 7:30 am (exact time may vary depending on the location of your hotel) we will take you to Mistico Park to begin an approximately two hour hike along easy trails. There are both suspension (hanging) and fixed bridges that provide spectacular views; you won’t want to miss out on seeing the waterfall inside the park. See the forest from a different perspective and observe the flora and fauna of the area. 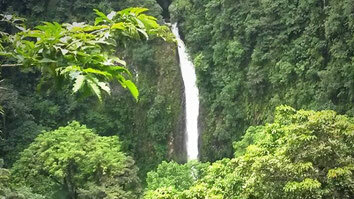 After your hike we will transport you in our shuttle van to the second attraction to visit—La Fortuna Waterfall. This is a favorite for the majority of the tourists that visit us and is famous for its 60 meter height. After enjoying a fantastic view from the lookout and then a 25 minute hike we will arrive at the river where you can enjoy its delightful cool, crystalline waters with a swim or a stop to take photos to share with friends. Around 12:30 pm we will go enjoy a delicious typical Costa Rican lunch in a restaurant near the town of La Fortuna. 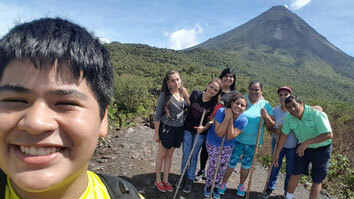 At approximately 2:00 pm we’ll head to the trails located along the edges of Arenal Volcano; during this tour your guide will provide relevant information about the activity of the volcano while—weather cooperating—enjoying spectacular views from a lookout very near the volcano. To end this day of activity we will take you to relax in the delightful Hot Springs that emanate directly from Arenal Volcano. 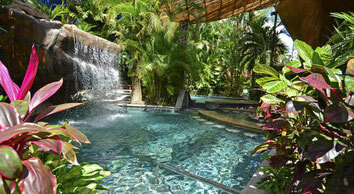 At the same spot you will enjoy a buffet dinner.